January 03, 2015 / Preferred Roof Services Inc.
Chinaberry Inn bed and breakfast has long been one of Tacoma's local gems as far as quality food and lodging. The old town construction provides an atmosphere that transcends time and helps clients slow down from the business of life. When we received the call to potentially be a part of renovating the historic building with a new roof we knew we had to provide a product and service that are well above standard. At Preferred Roof Services that is our mode of operation! We strive to give the best to our customers and to be the best in our industry, that is why the owners of Chinaberry Inn awarded us with the contractor for the roof replacement. 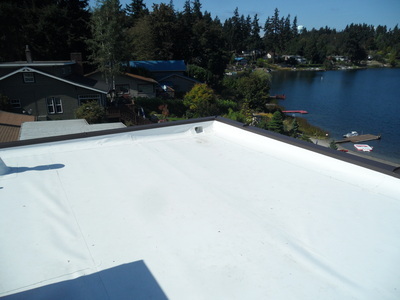 We are a family owned and operated Tacoma Roofing Contractor that has been serving the roofing needs as a business for over a decade and as technicians for nearly 50 years! We are at your service for all of your commercial roofing and residential re-roof or repair needs. 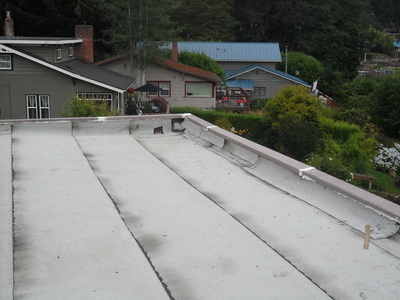 Once we were selected at the preferred roofing company to perform the work we got right to it. We removed the existing 3 tab roofing system and installed a new Malarkey roofing system including: sheathing replacement where necessary, new synthetic underlayment (roof deck protection), starter shingles, Highlander Algae Resistant field shingles, hip and ridge shingles, new vents, pipe boots and metal flashing's. We did not cut corners or spare any expense when building the proper roofing system for our valued customer. We chose to install the Malarkey Highlander AR roofing shingle on this project because we believe in the integrity of the product. Malarkey roofing shingles are manufactured in the Pacific Northwest which means we support the local economy when we install them! Their shingle construction is second to none in many areas. They have the highest concentrated AR (algae resistant) rating of all shingles. This is a big deal for our region considering the level of precipitation unleashed upon our roofs on a yearly basis. This AR rating helps to fight against discoloration and streaking on your roof. In addition Malarkey shingles have a patented tapered nail line which eliminates what is called "water troughing." Water troughing is when the area of the shingle behind the lamination line settles and begins to collect water. It is especially prevalent on homes with roof slopes of 4:12 or less. The taper design eliminates this issue and makes Malarkey the best choice for many structures. In fact that is why many schools and government buildings in Washington State choose spec out Malarkey shingles on the majority of their projects. The quality of the shingle along with our workmanship warranty makes our product and service a safe choice for your next re-roof! Call Preferred Roof Services Today at 253-318-8918 Or Fill Out Our Estimate Form On The Link Below!